Rated 5 out of 5 by phooofeee from Nice little Hidden object game! It was a pretty typical HOG--nice variety of melodies-trash to find, lost and found items--lots of variety of puzzles to solve. I played the 60 minute trial but will not buy it just because it's very similar to so many other HOGs. Rated 5 out of 5 by soul4ever from Great pure hidden objects game Yet another great game from the series of "vacation adventures". This is HO game with no plot attached to it, just HOS scenes one after another with your easy to do puzzles in between. The graphics are great: Very clear and the colors are bright enough, the objects look as real as you want them to be. Cool looking graphics, just like in every game that is made by these devs. They use the same music from previous games and it's OK because it is a music that at least I could live with, relaxing and not dramatic or annoying like some games nowadays do have in them. This whole game is all about taking it easy. You collect trash for points, you collect HOS and you collect extra objects that translate to money which you can use to buy souvenirs. Nice little gem of HOS game, I love them games, sometimes that's what I need no storyline to follow, no mystery to solve just find them hidden objects and that's all, and this game delivers it with ease. This is your chill pill, something to make the time go by without committing to too much thinking, all while looking for items on your screen. True definition of HOS game. I recommend! Rated 5 out of 5 by pattya58 from Love It! I really love this game and enjoyed the first one to. If you like a nice relaxing game then this is the one for you. Like the music and good story line. Makes me want to go on a cruise. HOG are not difficult and mini puzzles are not that hard. Tired of those witchy and gorey games and the murder mystery one. Cant wait till they come out with the next park ranger series game. Been watching for it. for me sometimes it makes me feel like you are right there in the scene. Love it. I replay these games cause they are fun and relaxing. Rated 5 out of 5 by KelseyCO from Relaxing and Fun Hidden Object Game I really like these types of games, I think they are very fun yet at the same time it's hard to stop playing, as if the more you play the more addicting it becomes to go to the next level and the next. The mini games between each new location on the cruise ship are puzzles, find the differences and seek and find, etc. These make you think not to mention looking for lost and found items and so much more. There are many things going on to keep you going and it doesn't feel like a repeat over and over again. I like games like these Vacation Cruise, Big City Adventure and Forest Ranger, they are a nice in between break from other games for a change of pace. I do recommend this game for all who like to play a nice and relaxing Hidden Object Game. Rated 5 out of 5 by kdubs from Another Vacation Adventure...without having to leave home. This review is based on the 1-hr demo (glitch-free I'm happy to report). I do love this series whether set in our US parks or on a cruise. It's all Hidden Object (word lists) with puzzles between each level. Not too hard to follow the 'story' -- it's a vacation! There are some slightly interactive items on the lists which appear in a different color. As always, the collectibles and recycling items are back. The silhouetted collectibles can be tough but I love looking for them. It's nice that the lid goes back on the recycling can when you've found all of it -- a major improvement over earlier games in the series. I'm adding this to my way-too-big BigFish collection because I can't resist the wonderfully relaxing vibe of being on a vacation -- without even having to leave home. Rated 5 out of 5 by Corie60 from GREAT THE OLD FASHIONED WAY I truly do like these games, the Park Ranger Games and the trips to Barcelona, San Francisco, Vancouver and other city games. I do love a good HOPA as a staple, but these are a bit of fresh air and time to take a breath and play the way I did when I first fell in love with Hidden Object Games. Give her a good try, they are very relaxing. You always have a coupon or two laying about to give these a fair shot. Nothing ventured, nothing gained. Don't expect your grey matter to be taxed however LOL. Have some fun. Rated 5 out of 5 by a41249 from Vacation Cruise yes yes If you liked cruise director you will like this game. I feel it is more interesting than the first one. Many different mini games to play. You can still go back and replay an episode to get a higher score.Many people will think it is old school HOGs but that is what I enjoy. If you want to just relax andnot have blood & gore this is the game to play. It is a keeper for sure. Rated 5 out of 5 by Novalin from Very Appealing Enjoyed the first one in the series as I have all of this type. This one seems as good if not better. Liked it as soon as I started playing the trial and bought it. Nice comfortable level of challenge seems to have good mini games . If you like this type of hidden object i recommend it. Rated 5 out of 5 by arnold1049 from LONG AWAITED CHAPTER TWO I played the free 60 minutes and my review is based on this. I love hidden object games likes these; no dark, supernatural beings, just bright, clear screens with nothing but hidden object scenes with some easy puzzles scattered throughout. There are two modes of play, with only minor differences and nothing that really makes one mode harder than the other. One mode has the tutorial, the other doesn't, and the hint and skip buttons recharge faster in one mode than the other. I never needed to use the skip button, and I only used the hint button once, on a find-the-difference puzzle, which is not my strong suit. Which reminds me of another good thing; having a hint available during the puzzles. That's a nice touch. The puzzles are very basic and not too hard: find the differences, rotate puzzle pieces to compete a picture, match two, etc. This game is not hard at all for experienced HOG players, but is a nice relaxing game to hone skills. Occasionally there will be a hidden object item that does take some searching. There are also 3 types of interactive hidden objects that make the scenes a bit more fun. The story is just something that allows the game to flow from HO scene to scene and is not that entertaining. The graphics for the humans make them look like mannequins, so not a lot of reality there. However, the rest of each scene inside the cruise ship makes me want to go on a cruise immediately, particularly when the protagonists get moved into 1st class. You earn a bronze, or a silver or a gold star depending on how well you do in three areas at each location: picking up trash, finding lost items, and finding all the hidden objects. This game made a much-needed improvement in the trash-finding step by showing when all the trash has been found in the scene. This is done by the lid being placed on the trash barrel at the bottom of the screen. If you are hung up on getting a gold star for every location, you can replay any location at any time to improve your play and get the gold. I'm glad this game was finally released and I hope it is followed up with more like it. When the 60 minutes was over, I immediately purchased it. Rated 5 out of 5 by pennmom36 from Cruising Around The World Vacation Adventures is back and better than ever with the Round the World cruise. 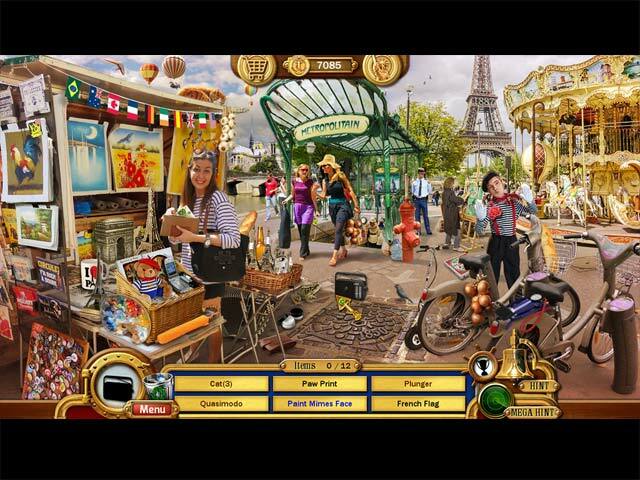 This is purely a HOG with Puzzles and Mini Games available between each Hidden Object Scene. You can choose either Casual or Challenge modes as well as which gender of cruise director you want. Each scene has Lost items that need found, the portal on the bottom left will show these items one at a time as silhouetted shapes, when all have been found the portal will close. Each scene has recyclable items that need to be found such as paper bags, cans, and bottles, when all recyclable items have been found the trash can icon will close its lid. The items to find are list finds, items in red are hidden in or behind something, items in blue are tasks to complete such as returning the captain's hat or picking up laundry and placing it in the hamper. There are trophies to earn and you are scored a bronze star if you find all items, a silver star if you find all lost items OR all recyclable items and a gold star when you find all lost items and recyclable items. You will also receive an eagle eye bonus if you don't use the hint, there is also a Mega Hint system that will briefly show you all available items on the list. 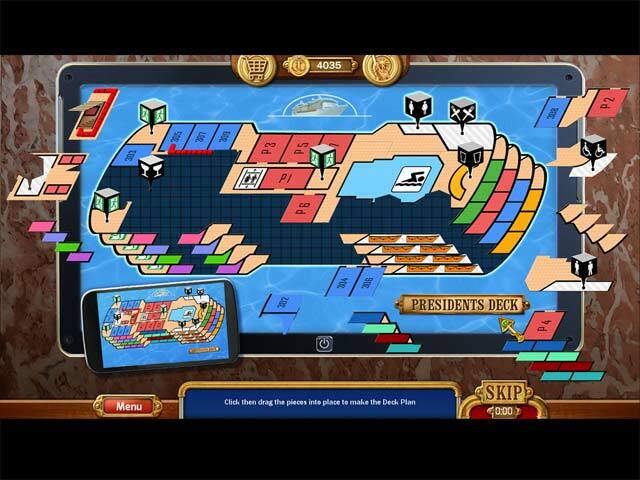 After each HOG you will get to solve a puzzle or mini game such as rotating puzzle tiles to complete a picture, Match 2 identical items by flipping over two cards at a time, Spot the Difference between two almost identical pictures, or putting together a jigsaw type puzzle of the ship's layout. The money you earn can be used to purchase souvenirs and view them on your collectible shelf, but I don't really get the point of that feature, enjoy! Rated 4 out of 5 by denniann2 from cruise around the world a typical match 3 game with mini games. had to skip some of them. i just couldn't figure them out. some of the items are very small and blend so well that unless i would have used a magnifying lens i wouldn't have seen them and not sure i would have seen them even with it. it is a good game as long as you have fairly good eyesight. Rated 4 out of 5 by SouthSeaSadie from Very involving game A really good HO game with most games very well suited to the topic (a cruise ship). Only one thing...Casual Arts can't make up its mind as to the names of the incredibly wealthy cruise patrons. They're called Bob and Emma and Bob and Mary and Bob has a full head of hair in some scenes and a shaven head in others. Weird. Rated 4 out of 5 by cowclaudia from Just like the others Lots of HOGS but entirely too many mini games most of which were boring and one where you had to follow a map to do the game - map was practically illegible. Ok game to pass the time if you're bored with the usual have to buy the collector's edition/strategy guide games which seems to be the norm these days. Will recommend only for that reason. Rated 4 out of 5 by nanomama from straight forward HOG I enjoyed finding the objects, but the puzzles were difficult. there wasn't enough time allowed and the click-to-rotate the pieces were the kind that rotated two pieces at a time, making it frustrating. Rated 4 out of 5 by NashVegaShowGirl from LOVE THE GAME; PLEASE DITCH THE GUITAR I've purchased all the Park Ranger games and both Cruise Director games. I'm tired of the doom and gloom games and wanted a break - this provides a relaxing escape. I don't have to travel all over the place to find things, consult strategy guides, mix potions, or become depressed by all the darkness that's in so many of the other games. My only complaint, as I'm part way through Cruise Director 2, is that I wish they had left the guitar behind. Cruise Director 1 had more piano music and less of the guitar that follows you everywhere in the Park Ranger series - and I really enjoyed it. However, for Cruise Director 2, they have dragged the guitar out again. I would much rather hear the piano music - much more relaxing and adds to the ambiance. My request to the developer would be that if there is a Cruise Director 3, I'll be on board and set sail with you if you will just ditch that guitar. Rated 3 out of 5 by heartitraces from OK HOG I really enjoyed the first game in this series, so I was excited to see this one! Sadly I found the side games really frustrating. There were too many of them! After every hidden object scene you were solving a puzzle with micro small puzzle pieces. My eyes aren't bad, and I found I had to have the laptop inches away from my face to try and play. I like the company that designs these games, so I will purchase the next in this series. But if the creators are reading this, please use less side puzzle games, maybe after every 5 scenes that we do a hidden object?! Rated 3 out of 5 by Hollyninelives from Not bad The HOS are pretty good, but after every one is a puzzle, match game, or some other kind of tedious, time consuming challenge that I usually skip. They throw of the rhythm of the HOS and are not necessary. Those little challenges are supposed to be a reward, not torture, for a job well done in the HOS. Some of them are just not even doable. Rated 3 out of 5 by TUCKY831 from A religious prerequiste should be posted. Though visually appealing and at time challenging the game has several clues that require previous religious knowledge (Christian). If this is not your faith then you are at a disadvantage. Think this game should be advertised as "designed for Christians"
Rated 3 out of 5 by saltspray27 from Too much like first one. 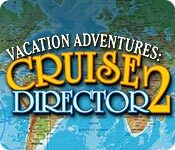 I enjoyed playing the first Vacation adventure Cruise Director and so I ordered the second Vacation Adventure. This second one has many scenes similar to the first one. Am disappointed. Rated 2 out of 5 by thelemons from Good puzzles but slow paced snoozefest When I tried the demo, I thought I was in for treat, however, the pace of this game almost put me to sleep! The premise was good and the puzzles were good, some of which were hard to find. However, the pace just seemed way too slow. The game goes HOG then puzzle then HOG again. It is a good game for the casual player but for those that like a good pace story, I would skip. Rated 1 out of 5 by bya68 from Worst game ever This is the most boring game. What a waste of my time and money to buy it. Rated 1 out of 5 by bfeinstein from A cruise only marginally better than sailing on the Titanic The passengers on the Lusitania had more fun after the U-Boat torpedoed them then I had playing this. This is one of the worst games in the Big Fish library. You are on board what has to be the worst cruise ship on the planet. If this is what the designers think represents "super luxurious," then the only boat they have been on has oars. You expect to go on a cruise ship to be pampered, yet you are going to spend this entire cruise picking up trash for recycling, finding other people's missing items, and finding random junk. Some vacation adventure. This game came out in 2015. Game design has advanced beyond static scenes with low-res artwork where you look for things for no reason. Why am I looking for 4 cats and two umbrellas when it is the sunniest day of the year? Good games give the HO scenes a reason for being. This game just gives you the chore--and this is a chore since it's not fun--of finding random stuff. The game is dated, slow, and like a lot of games you were already tiring of 10 years ago. The expectation of good graphics, more engaging game play and some actual fun was like kryptonite to the game designers. There is not an original thought in the creation of this game. There is no sign of actual effort. The best thing to do is to bury this game. At sea. Don't play it.